Which Baby Blankets are Best? Wow, there are definitely a LOT of baby blankets available these days– and they all claim to the THE best baby blanket ever. Most of those baby blankets ARE really good and it’s easy to see that when you read all the raving reviews. But, when I set out to find the right baby blanket for a gift, I wanted something specific as I’m sure you do. Maybe you live in where it's cold and you need a warm baby blanket for winter. Maybe you want the BEST baby blanket with satin trim. Perhaps you need one for the car seat or you want to keep all your baby items ORGANIC. Or maybe you are a new parent and need a really good baby blanket for swaddling. From summer to winter, hopefully my experience will help you find the best baby blanket for your newborn. Baby blankets are among the top choices when it comes to baby shower gifts. 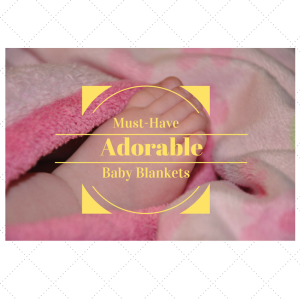 They are not are only beautiful but also very useful for cuddling, swaddling and bathing a newborn. They are also designed to hold babies with warmth and softness, making them feel secured and loved. One of the best choices are silky soft baby blankets. These baby layettes not just give warm feeling to a child, but they also add style to the child's room as well as complement other baby accessories. Baby blankets can also be used by the parents for nursing their little one. Most of them carry one or two pieces of blankets to have a clean place where they can lay their child for a diaper change. Even the child becomes a toddler, blankets can still be useful. A "blankie" as many would call, can still provide a feeling of comfort and security to a toddler. There are some people, though, who find blankets as another useful hand towels. Mommies may find themselves using a baby blanket to swaddle their little one after bathing. Swaddling a baby using a blanket is what many moms prefer since flannel receiving blankets are softer and very easy to use than regular baby towels. Most babies enjoy being swaddled as much as their mom enjoys swaddling them. Using a quality baby blanket, a mom can hush her child from crying or make her baby sleep more soundly. However, parents should consider the right ways on how to swaddle their child using a baby blanket. The most important of all is to make sure that it doesn't cover the face of the baby, and the child is not wrapped tightly. While some babies like to be wrapped a little bit tight because they feel contained, there infants however who wants to their arms and legs free to move around. There are so many choices to choose from when it comes to baby blankets. It can be a bit tricky for most people to choose between them because quality blankets are all soft and adorable. Moms and gift-givers can find lots of beautiful, fun, and playful designs on baby blankets these days. For a perfect newborn gift, a gift-giver may opt to personalize his/her choice by having the child's name or initials be embroidered on the layette. There are also crocheted baby blankets that are available for those who are looking for classy-type blankets.